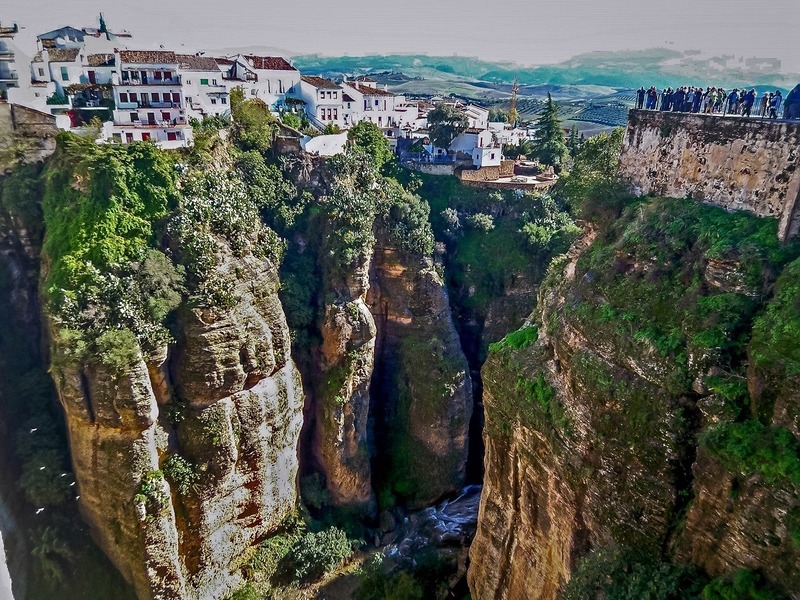 Among all the hill towns in Andalusia, Ronda stands apart – both for its natural beauty as well as its history. It is one of the White Hill Towns in southern Spain. The towns are so named because of the beautiful whitewashed facades of many of their buildings – helping keep them cool in the summer sun. 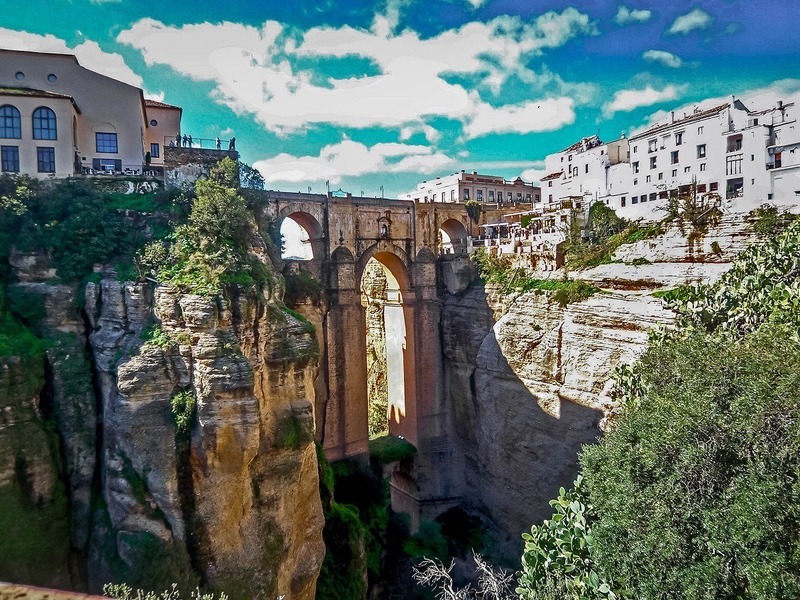 Ronda is primarily known for its stunning Puente Nuevo bride (or new bridge), that links the two parts of the city sitting high above a gorge. 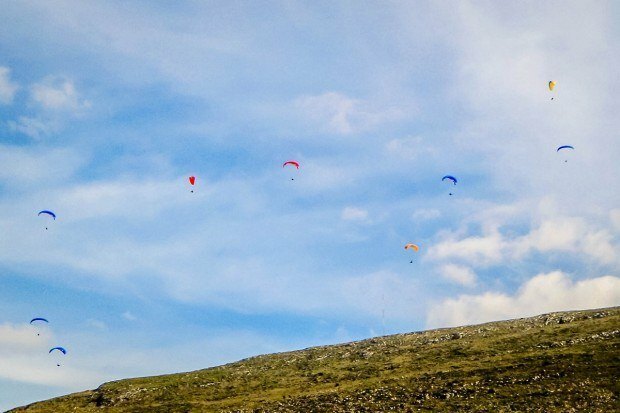 From the bridge, you can see stunning vistas of the mountains all around the town. 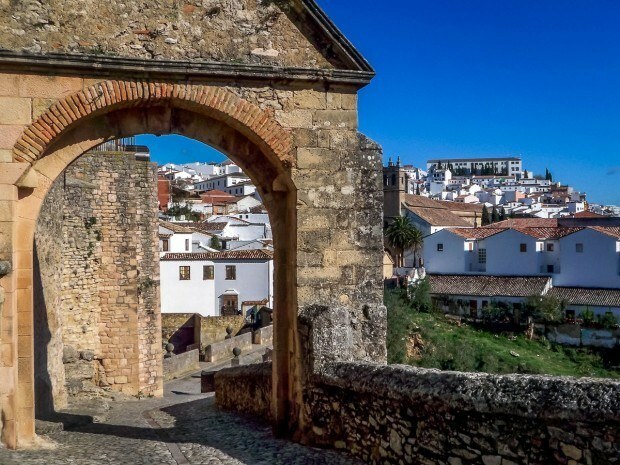 Completed in 1793, it took over four decades to construct the bridge, which spans the nearly 400 foot deep gorge over the Guadalevin River in the center of town. It is gorges. The Puente Nuevo also plays a critical role in the city’s history. During the Spanish Civil War, prisoners on both sides of the conflict were flung to their deaths from the bridge. The scene inspired Ernest Hemingway to include it in his book, For Whom the Bell Tolls. Hemingway was one of many artists and writers who found inspiration in the city’s beauty. For us, we discovered one of the best things to do in Ronda is simply to walk the city and take pictures. 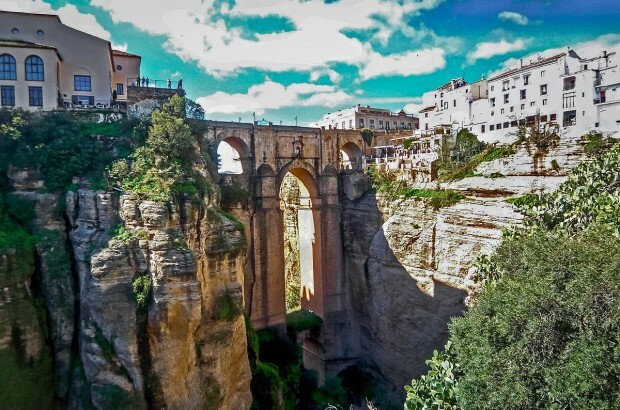 The highlight is the beautiful views of the Puente Nuevo from all sides of the gorge, but also views from the lookout of the bridge itself. The steep trail down to the Puerta de los Molinas also offers great views of the bridge. We could spend all day photographing the city’s bridges and the beautiful Moorish architecture. Ronda is simply gorges. 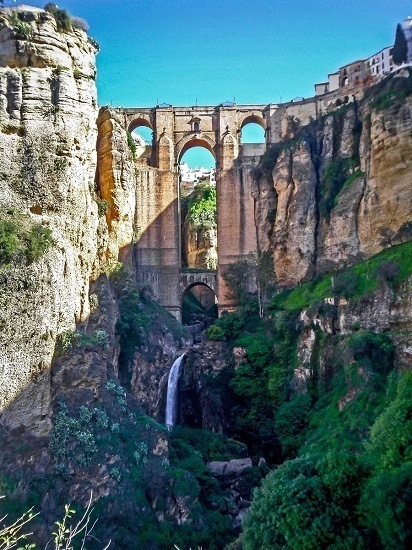 We visited Ronda on a day trip between Tarifa/Algeciras and Granada. Ronda makes a nice stopping point to get lunch and stop over for a few hours. After arriving in town, we tried to stash our bags in lockers at the train station, only to find them out of order (and looking rather permanently out of order). We walked several blocks down the street to a bus station, where we found the last two working lockers. If you come on a Ronda day trip, time will be short. There are a number of quick service restaurants on the Plaza de Espana for lunch. What do you think about Ronda is Gorges? You need to use the correct spelling, it is gorgeous not gorges if you are trying to say something is very beautiful. Thanks for commenting Greg. It’s actually a play on words. The word “gorgeous” does indeed mean beautiful. But the word “gorges” means a deep ravine – of which there are several in Ronda.